If any combination of the following interest you; bloodless revolution, awesome 80s haircuts, stone washed jeans, storming castles, music festivals, Soviet history, progressive politics, human chains, folk songs, and heart warming ends, The Singing Revolution is a film that you should see. Relating the story of the Baltic country Estonia liberating from the USSR, this film has educational elements, though centered around the largest annual traditional music Festival of National Unity and asking the question, “Can Culture Hold a People Together?” Culling contemporary footage from the 1930s through the 1990s, as well as interviews with survivors, children, and participants in Estonia’s 60 year struggle for independence and liberty. Giving a brief overview of what befell the country during World War II, Estonia was occupied by both the Nazi’s and the Communist Red Army, finally being claimed by Stalin after the war. It’s citizens arrested, sent to Siberia, and the oppressive propaganda of Communist Russia grinding out any thought of individual expression or political thought, Estonia was a country shackled behind the Iron Curtain. The country was able to survive and maintain an individual ethnic identity largely due to the sheer amount of folk songs the country has, one of the largest collections in the world. Even under the heel of the Communists, in 1947, the Estonians began peaceful protests as twenty five thousand performers sang a song in their Native Estonian of National Unity at the annual Festival that was based on a 100-year-old poem. Not until the mid 1980s, when Gorbachev came to power in the USSR, did political groups start to push the boundaries of Communist rule, speaking the truth of their country’s past as a Rock and Roll Revolution spread throughout the land. Synthesizers and stone washed jeans ruled the day. In 1989 over three hundred thousand people attended the annual Festival to hear spontaneous speeches on how Estonian needed to be the national language and to reveal further the truth of the past. Intimately tied to the liberation movements of Latvia, Lithuania, and the crumbling of the USSR itself, The Singing Revolution shows that with nonviolent and intelligent political action, the unity of a culture can overcome even the most feared and brutal regimes. All and all, if you like 20th century History, this oft overlooked chapter is very interesting and enjoyable. 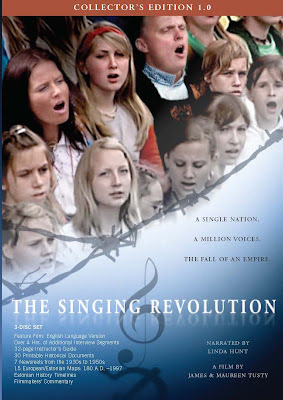 The Singing Revolution Collector’s Edition 3 disc DVD set is exclusively available now at www.thesingingrevolution.com, while a single disc version will be available on Amazon.com on February 3, 2001.